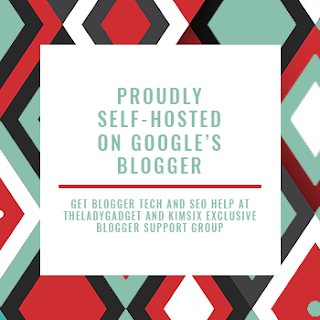 You may have noticed a pattern in my latest blog posts . . . all about French Country. 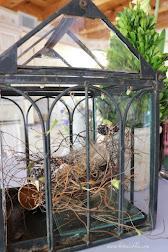 Little by little I have transformed parts of my American Country house decor to French Country. It has been a long and joyous journey and is still not finished. 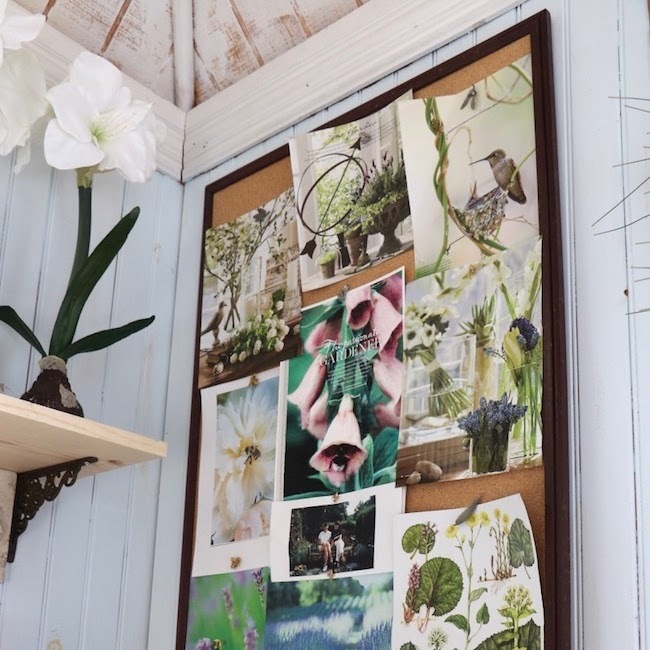 While the swing loft was decluttered for carpet cleaning, I took a fresh look at the space, did a lot of creative daydreaming (following StoneGable's Best Decor Tip You Will Ever Get), and then gathered items from all over the house and garden shed. 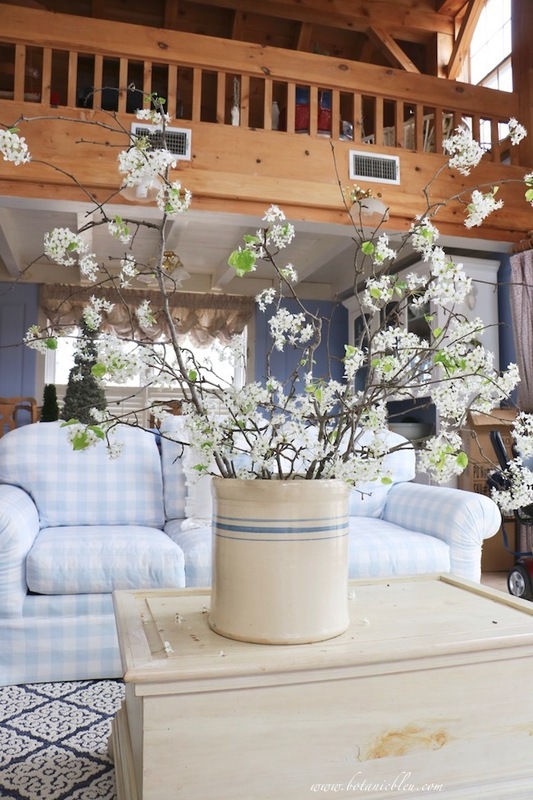 The transformation was quick and easy using beloved items from other rooms. 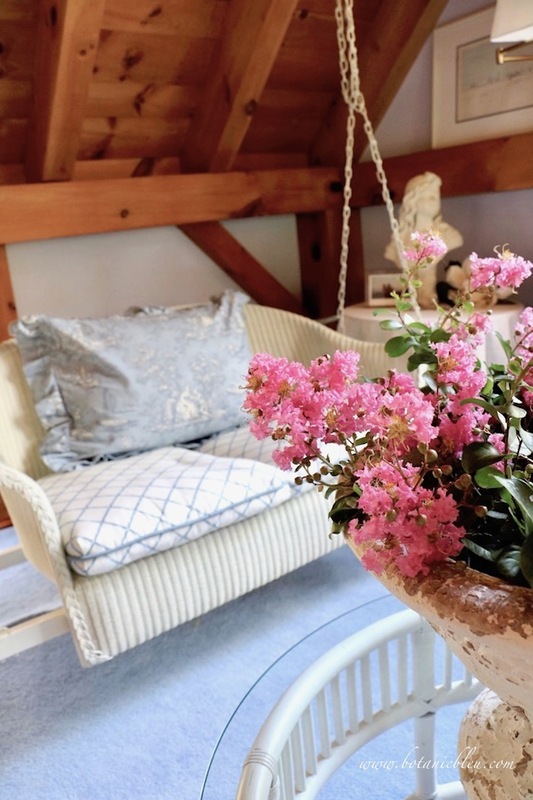 In a few hours, a cozy, relaxing French Country seating area was created with the swing as its focal point. Things that stayed the same. The foundation furniture remained as before. Accessories were changed. And what a difference a few key changes made. 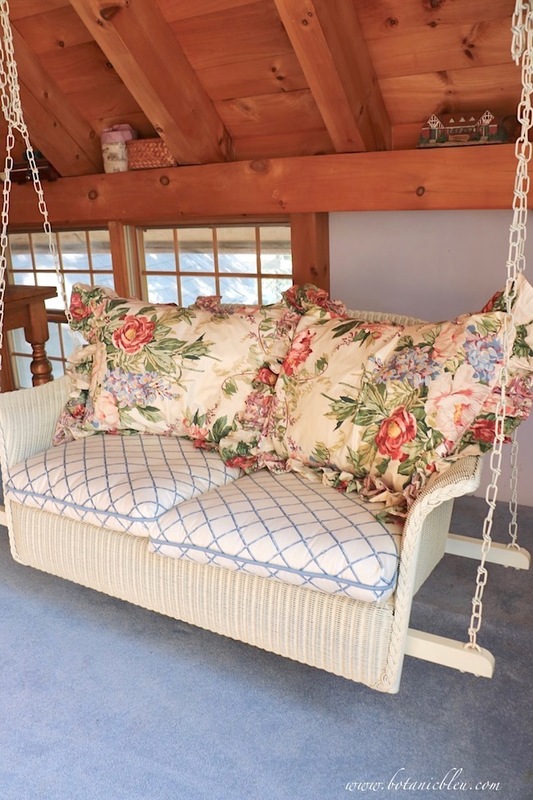 Gone are the floral rose pillows on the swing and chair. 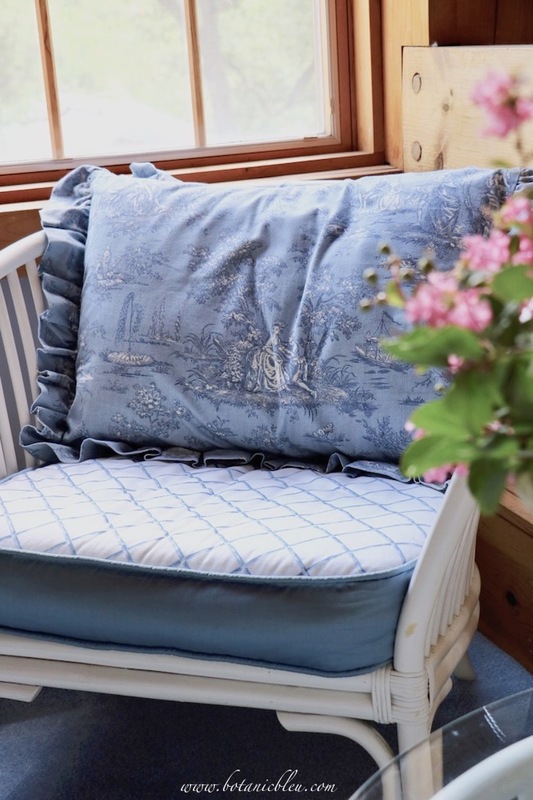 Blue toile is now the highlight of the swing loft decorated in French Country style for summer. In the place of the rose floral shams are blue and white toile shams from my master bedroom. The shams match the master bedroom balloon shades, bedroom armchair, and bathroom ottoman sitting next to the white vanity. Decorating trends come and go. At one time, one pattern was used on every item in the same room. Although toile curtains, shams, and armchair match in my bedroom, not every upholstered piece or fabric matches. The quilts, throw pillows, sheets, desk chair, etc... coordinate, but are not in the same toile pattern. Along came another trend to decorate every room in a different color palette. An unwritten rule, but often observed, is not to repeat the same fabric in more than one room. Somewhere in the past few years the neutral look, including all white rooms, swept through the USA. Everyone should feel free to decorate with whatever colors and styles speak to her/him. Your home is your haven and should reflect what you love. For me, using one color, a light blue, on almost every wall in the house has worked for almost thirty-one years. The pale blue is a backdrop for layering other colors onto it. By using one color throughout the house, pillows, chairs, prints, rugs, curtains, etc... coordinate with each other and can move from one space to the next without requiring major repainting. 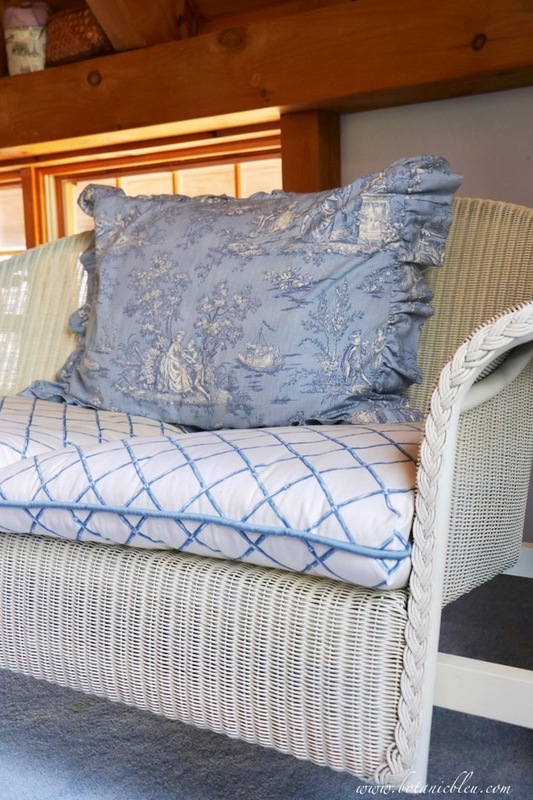 The blue toile is one of my all-time favorite fabrics. So, I disregard the unwritten rule and use it in several rooms at the same time. . . Cushions here in the swing loft, a French Country bench in the master bathroom, and balloon shades in the master bedroom. The key to using the same fabric in several rooms is to use just one or two items in each room for different purposes . . . cushions, curtains, bench. Using different pieces keeps the rooms from looking all the same. Use checks, stripes, florals, and toile together to keep a one-color house from being bland. 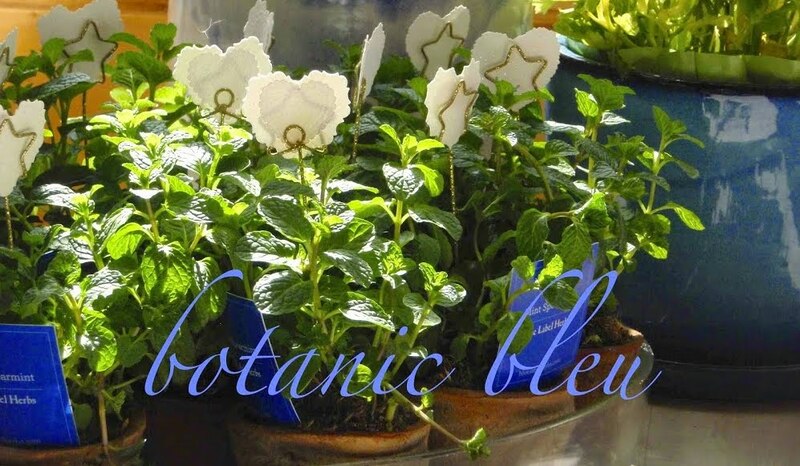 Mix in other colors as accents to brighten areas. 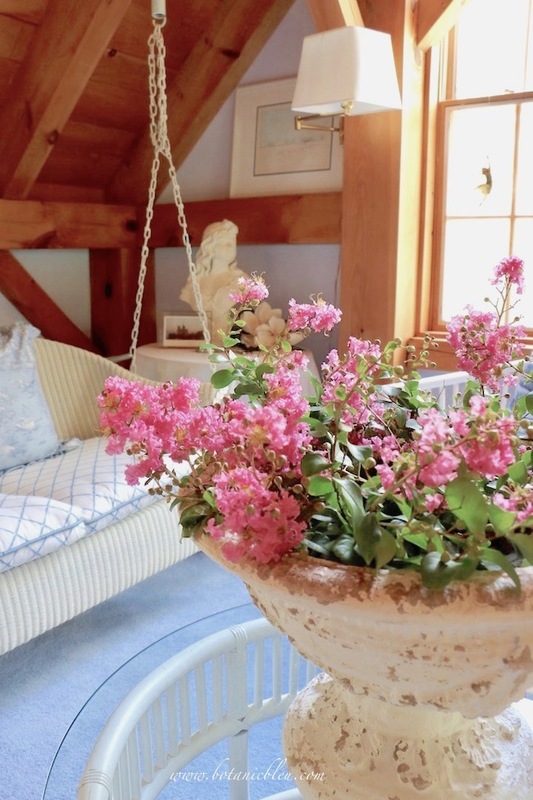 The pink crepe myrtle flowers in the French Country white urn add both texture and color to give the swing loft life. 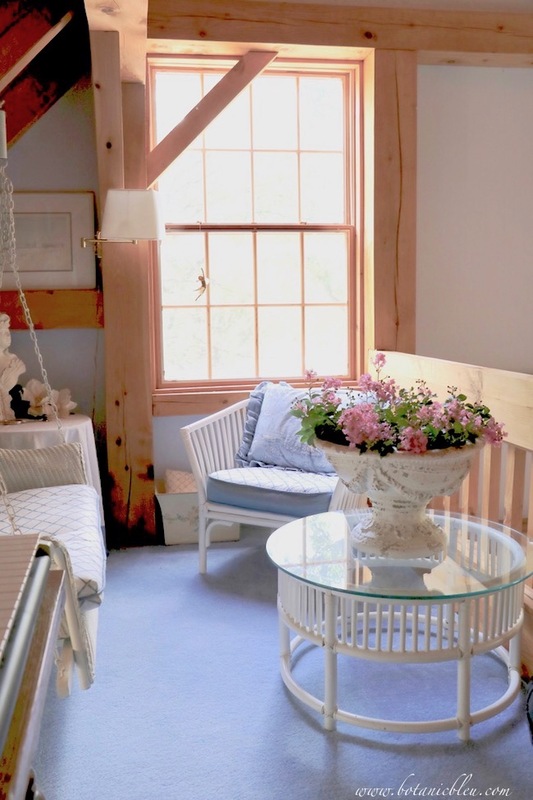 A rose patterned round tablecloth matched the rose pillows on the swing and white chair. 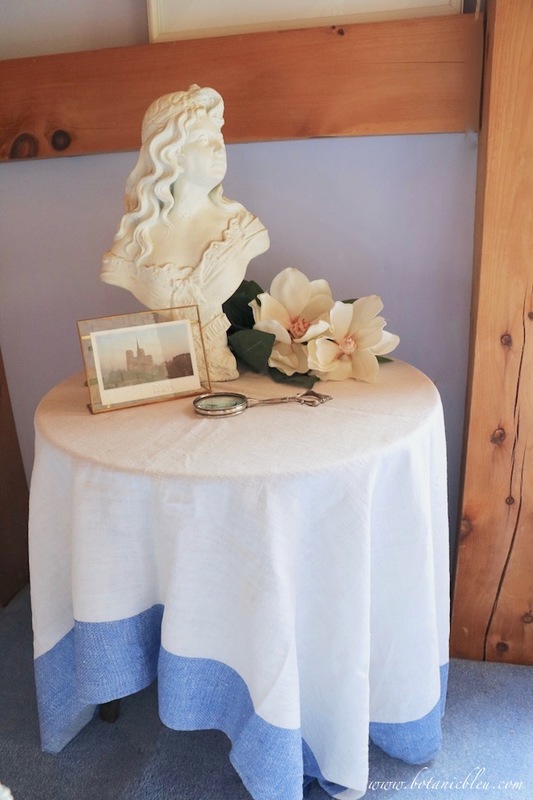 Now, there is a vintage blue and white silk blend rectangular tablecloth that my sister covets. I love my sister and have made sacrificial gifts to her, but not this time. Part of the reason items can move freely from one area of my home to another spot is all of the blue colors blend with each other. Blue shades can be red based or green based. I always keep my eyes open for the red based blues that go with my walls. After a lifetime of loving blues, I can tell if a blue will blend. When I find something in the right bleu tones I have been wanting, I buy it. 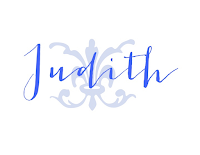 Because, it may be years, if ever, before I spot the item in the right shade of blue again. Most blues are green based, not my favorite red based. TIP: If you have a favorite color you search for, but have a hard time knowing if something you find is the right shade, pick up a paint chip card in your color from a hardware store to carry in your purse all the time. When you find an item you love and need to know if the color will blend, compare it to your paint chip card. A Paris postcard bought many years ago brings memories to my mind as I gently swing and daydream in the air conditioned loft on hot summer afternoons. A wistful, far away look in the young girl's eyes echoes how my eyes must look as I while away lazy days in the swing. 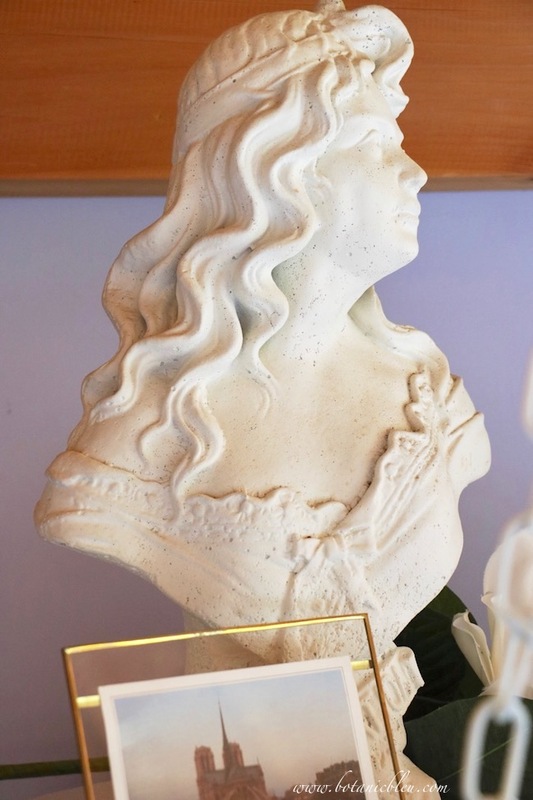 Elegant busts do not have to be expensive. This concrete bust came from a concrete statuary along side the Interstate. She was a dull gray cement color until I used Rustoleum Heirloom White spray paint to transform her. An extra pillow hides magazines. 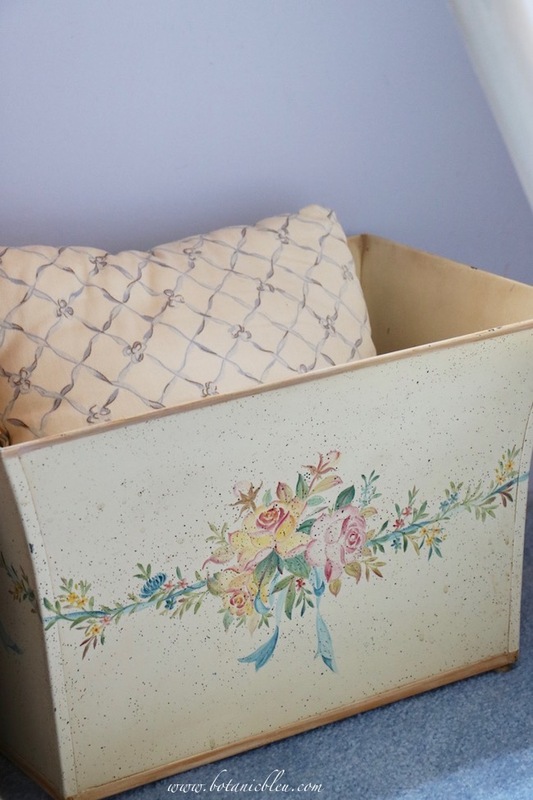 My mother gave me the pillow, and the magazine holder belonged to a dear friend who passed away several years ago. Both my mother and friend traveled with me to France, but at different times. When decorating remember to include items filled with memories of dear friends, family, and shared places. Decor in French homes includes items with patina passed down through the ages from family members. 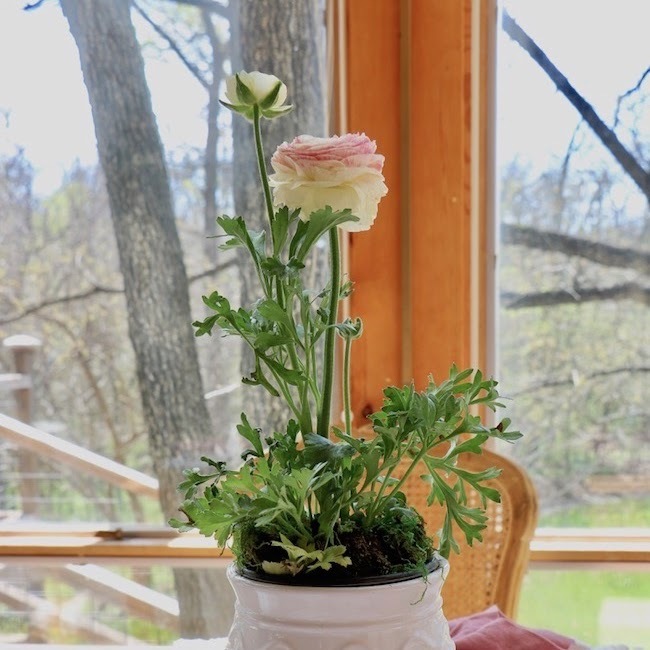 And, include flowers for no special reason to make your French Country decor reflect a life filled with joy. 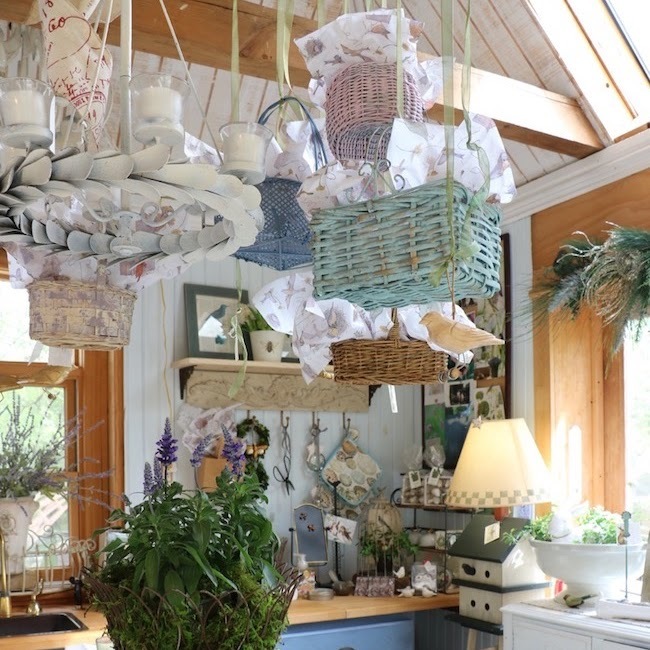 The swing loft is not the only area with a new French Country look. Watch for more posts about French Country in the coming days. 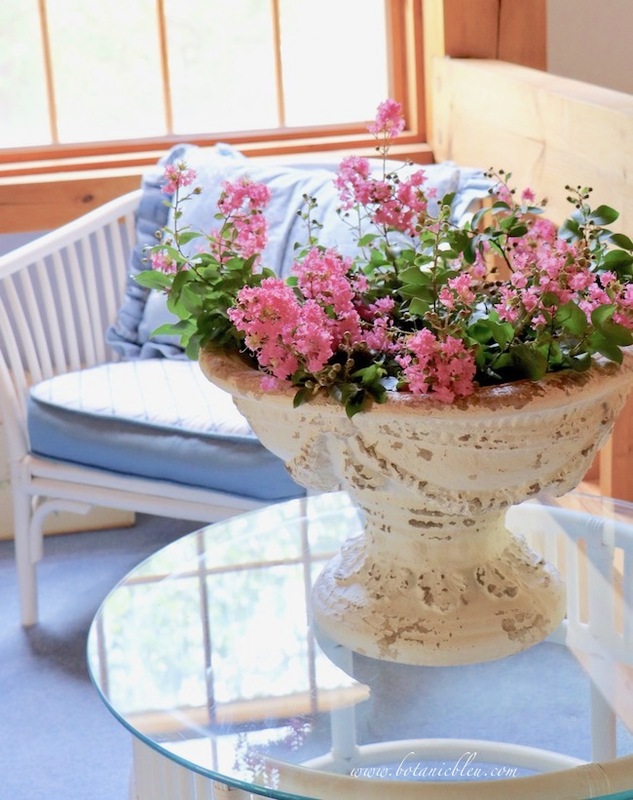 Yes, this spring has been a very good season for finding French Country items to mix with my existing decor. What are you looking for to transform a space in your home? It looks beautiful. I could see sitting up their relaxing and reading a good book or just relaxing from a hard day. 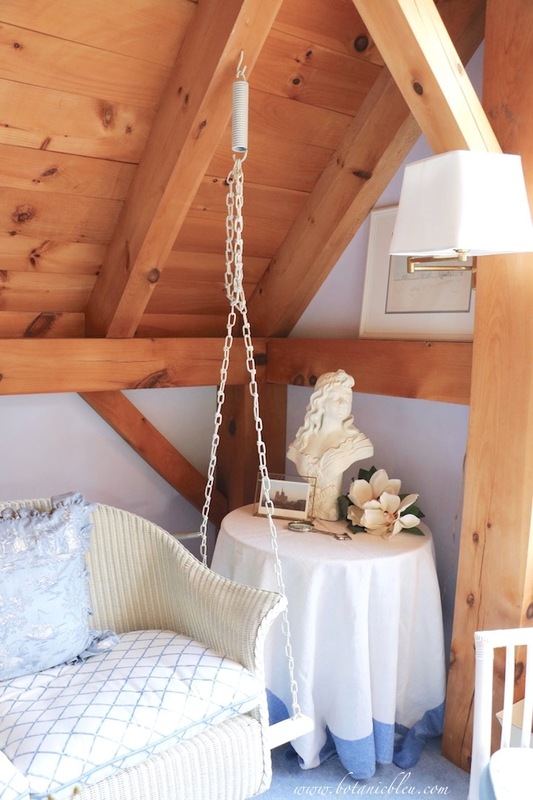 The loft swing is my place for a quiet retreat. Thank you, Jane. Blue is my favorite color ... who would have guessed? What a glorious space! That would be my nesting spot, for certain. 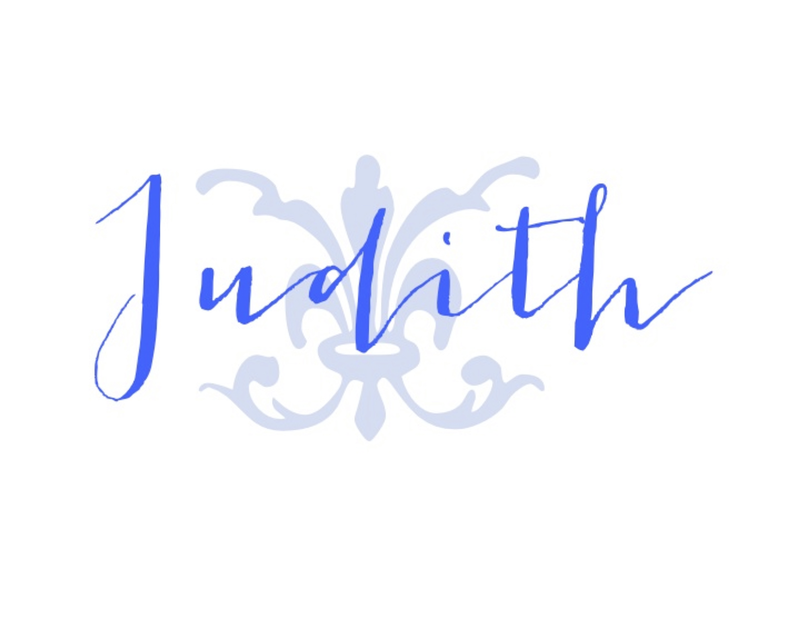 Happy Summer Solstice, Judith! Thanks. 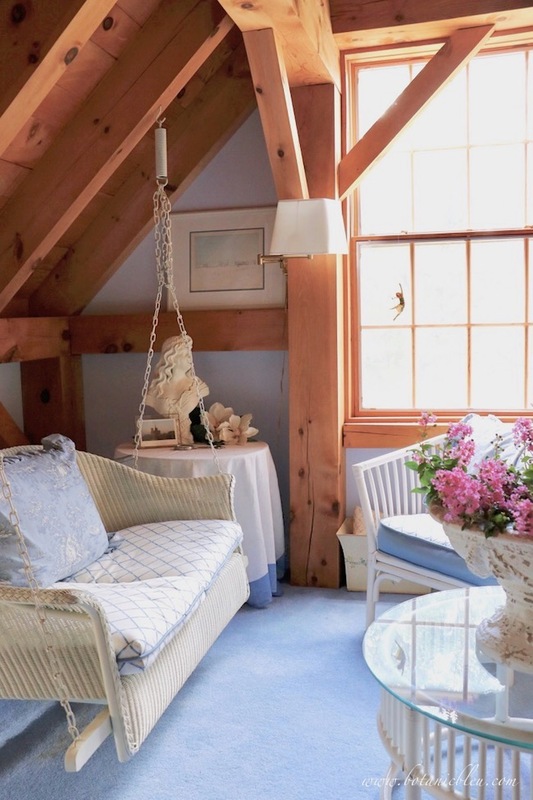 The swing loft is a nice little spot for hiding on a hot summer's day. I love the swing in your loft! I really like your thoughts on decor and moving things from room to room, switching things up. I learned years ago about keeping a thread of color throughout all your rooms so there is a cohesive look, though it doesn’t have to be matchy. Thank you. I like the look of one room to flow into the rooms around it, too.